Dorothy lived a very simple life. She grew up with her siblings on the farm in Petersburg. She had many memories of shenanigans with her brothers and sisters out in the fields and at the school house. Jokes played on each other and of course ensuing arguments were the norm. 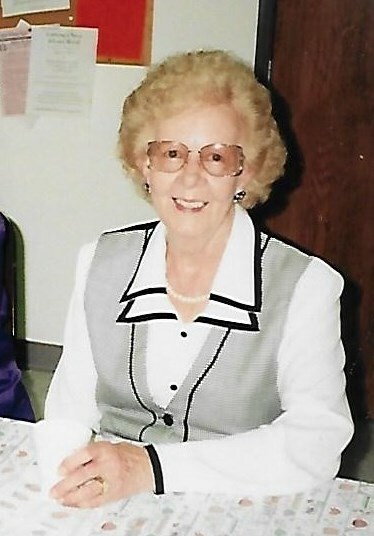 Dorothy loved dancing, laughter and had a fun sense of humor. She was also good at getting her point across to whomever needed straightening out, this could have come from her red hair. Dorothy graduated 8th grade then stayed on at the farm to help her mother. At age 16, Dorothy met a handsome and lively Wayne Martin Turnbull and married him a year later, on October 20, 1939 in Gordon. They had two daughters, Beverly Jane and Marilyn Kay. She cherished them greatly, formed a beautiful bond and called them her best friends as adults. They farmed until 1954 when Wayne was injured in a tractor accident. They moved into to town after this. With Dorothy’s tenacity she didn’t think twice to take jobs to help support the family. First as a nurse’s aide, which was a little too much for her after seeing her own father come in with a mangled hand. Then she worked as a clothes press, steaming clothes for 8 hours a day 7 days a week in a very hot small room. Dorothy describes when she was hired on in the catalogue department of JC Penney’s as “paradise”. She worked here for 28 years until her retirement. Wayne passed away in 1980. Dorothy was always moved by music, especially live bands at the local Legion clubs or watering holes where she would dance with anyone who was a willing partner but loved to dance with close friends and family. Dorothy met Mathias “Tese” George Janssen at one of these venues where he was playing his accordion. They enjoyed laughter and some travel. They married October 19th, 1985 in Rushville. Tese brought a bright spark to her life, one she had not experienced before. They had 3 ½ years together before he went to be with the Lord. She was so very grateful to have had his joy and love in her life even for the short time. Dorothy had four grandchildren, Brian Harris; Jeff (Julie) Harris; John (Shannon) Binegar, Lisa (Chad) Harley. They have many memories of back yard lawn darts, building tree forts with her red striped bed sheets up high in the old Elm in her front yard and countless laughs with her ribbing. She welcomed her 6 great-grandchildren with pride and joy. Allison and Anna Harris, Alan, Jenna, and Carsten Harley, and Reyna Binegar. She watched them grow and play in the sprinklers during the summer visits. Anna Belski, her cousin and close companion, was able to help Dorothy live in her home the last five years and her family was very grateful. Bonnie Jean (Guy) Orr mourns the loss of her sister. Step-son Tony (Anita) Janssen who was like the son she never had will miss her greatly. Dorothy’s husbands, Wayne Turnbull and "Tese" Janssen along with her daughters Bev and Marilyn met her in heaven with huge smiles and tight embraces. Her brothers and sisters who passed before her were, Genevieve Caroline (Loran) Hemmingway; Raymond William (Bernice) Warnke; Bernadine Ellen (Woodrow) Vollentine; Melvin John (Opel) Warnke.